Milan, Italy — Here’s just another reminder that politics in other parts of the world make the U.S. system look civil. The cover of right wing newspaper Libero offers up a nice drawing of Angela Merkel with a gigantic posterior, and Mario Monti crawling out from under it. The message is pretty clear. Mario Monti, the technocrat PM who was installed after Berlusconi, is a tool of the Germans. Also recall that Berlusconi has referred to Merkel as a “Lard arse” which this is evidently a reference to. And here’s a closer look at the image. Two other quick things to note. The top of the paper is about Berlusconi’s promise to refund the IMU tax, which we wrote about here. 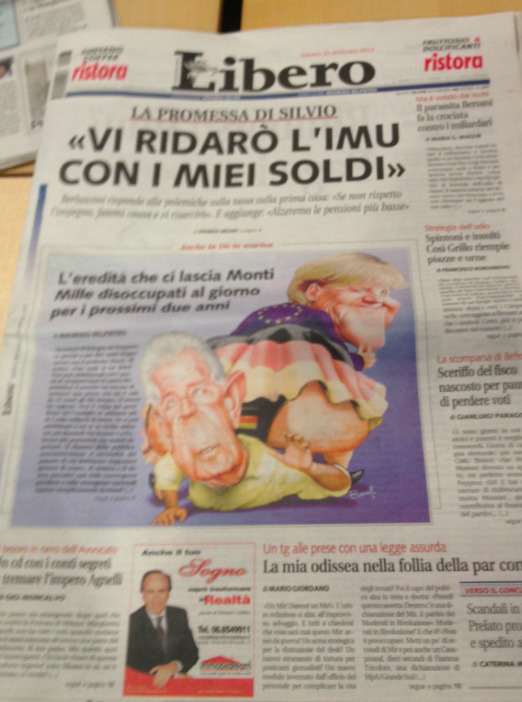 And the headline above the drawing is about Monti costing Italy 1,000s of jobs per day.